Perfect for small weddings, honeymoon, anniversary, or just a romantic getaway. 10 Mins from Helen, Ga.
SERENITY FOR TWO is about a 10 minute drive from downtown Helen, Ga.
No traffic, No noise, No stress here. Simply enjoy the peace, serenity & romantic nature of Serenity for Two. 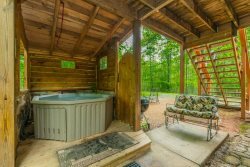 This cabin offers 1 King Size handmade twisted log bed with HUGE and very comfy mattress and is within steps of our king Arthur Jacuzzi Tub! Big enough for two, with an endless supply of hot water. Also has 2 Baths with a large walk-in rain forest showe! This cabin doubles as our wedding chapel and was custom made by local craftsman who really put there heart into the work. Everyone who comes here comments on the AMAZING work that was done. Many of the trees were recycled from the land it stands on. It features an Indoor Jacuzzi tub, a full size kitchen, a mini POOL TABLE, a flat screen TV with cable and a DVD Player. This cabin is perfect for a couple to spend their Honey Moon or Anniversary or any special occasion. Just coming to this cabin is sure to turn any getaway into that special occasion that will make memories for days to come. Pricing: Based on 2 people. Dist from Helen: 10 min. Dist from Trout Pond: 2 min. There is a short dirt road leading to the cabin. No Hot Tub ONLY Indoor Jacuzzi Tub.